Families seeking an unspoiled destination for their next family vacation should take a close look at St. Kitts. The Eastern Caribbean island changed its focus from sugar cane to tourism just three years ago, so this laid-back paradise still remains relatively undeveloped. St. Kitts has a particularly appealing place in the family travel world: it's an off the beaten path vacation destination with an abundance of natural attractions, direct flights, and a gorgeous brand name hotel. St. Kitts is a family travel find. The island's 36,000 residents call their home "Sugar City," and this 23-mile long slice of nirvana certainly is a sweet place for family vacations. St. Kitts is blessed with cooling tradewinds, abundant sunshine, and year-round temperatures of about 80 degrees. The island's terrain is quite diverse, with lush rainforests and beaches on both the Atlantic Ocean and the Caribbean Sea. Mt. Liamuiga towers over the island and its 3,792-foot volcanic peak provides a great venue for hiking and adventure. Here, green vervet monkeys and mongoose can be seen among the vine-covered banyan trees and rainforest vegetation. In the northern section of the island, rolling foothills are covered with grasslands and sugar cane plantations. These days, St. Kitts is better known for its sandy beaches than its sugar cane. The golden sand beaches at Frigate Bay and White House Bay are favorites with visitors, while Dieppe Bay and Pump Bay feature volcanic black sand beaches. Families enjoy spending the day on the white sands of Cockleshell Beach and having lunch at the Reggae Beach Bar & Grill, the new home of Wilbert, the 500-pound pig. 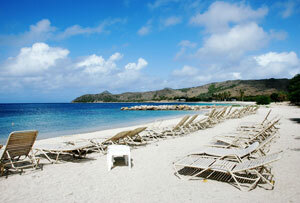 Beach chairs and umbrellas line the sandy shore and the bay's calm waters are perfect for kayaking and snorkeling. Kids love seeing Wilbert go for a swim and watching for the green vervet monkeys that live in the area. Although the island of St. Kitts is very laid-back, there are many adventures and diversions available. Take an adrenaline-charged hike to the top of Mt. Liamuiga, horseback ride through the rainforest, scuba dive in crystal clear waters, or go sailing aboard a catamaran. The St. Kitts Scenic Railway (also known as the "Sugar Cane Train") provides families with a unique way to tour the island. Kids will enjoy exploring Brimstone Hill Fortress National Park, one of the largest forts in the Caribbean, while fashion lovers can make their way to Romney Manor where Caribelle Batik produces handmade dyed clothes and colorful wall hangings. Nevis, a smaller unspoiled sister island, is just a short 45-minute ferry ride away. Getting to St. Kitts is easier than ever, with non-stop flights available through American Airlines, Delta Airlines and U.S. Airways. As befits an unspoiled paradise, there is only one large brand name hotel on the island. The St. Kitts Marriott Resort and The Royal Beach Casino is a 26-acre family-friendly hotel with 513 guest rooms and suites, a golden sand beach, three pools, numerous restaurants, an extensive Kids Club program, a large spa and fitness center, and a championship 18-hole golf course. Guest rooms and one-bedroom suites are available in the resort’s main building, and one- and two-bedroom suites are available in three-story garden houses. The beach at the St. Kitts Marriott has many cabanas for shade, chairs are plentiful at the pools, and spa treatments for kids and teens are also available at the resort. The multitude of restaurants at the Marriott make it easy for guests to relax and stay on property if they wish. Make sure to ask about the resort's all-inclusive plans if that type of vacation experience is appealing. The seafood, steak and Italian fine dining restaurants are perfect for a fancy family night out, while Calypso, the Bohemia Beach Bar & Grille, and the Pizza Shack offer more casual fare. The Clubhouse Grill, overlooking the resort's golf course, is a great place for lunch. All of the seated dining restaurants feature full children's menus, high chairs are available, and crayons and coloring books are also offered upon request. Families will find plenty of activities at the Marriott, including volleyball, kayaking, snorkeling, tennis, and daily programs. The inside scoop on each day's activities can be found at the resort's Activities Center near the main pool, and pool towels and rental equipment can be picked up there. The resort's Fitness Center features a broad array of equipment and complimentary fitness classes, along with special children's yoga classes at selected times. A Teen's Game Room featuring arcade and video games is also available. The Marriott's Pirates of St. Kitts Kids Club entertains younger guests daily with a variety of fun and educational activities for kids ages 5-12. Daily themed programs include Deep Sea Discovery Day, Mystery Monday, Caribbean Carnival, Pirate Day and more. The Club also includes a theater area - complete with bean bag chairs and a flat screen television - where kids get together for movies, crafts, food and fun. Other activities for kids include beach Olympics, arts and crafts, nature walks and games. A free family movie night with freshly popped popcorn is held from 7:30 to 9 p.m. on Tuesday evenings. 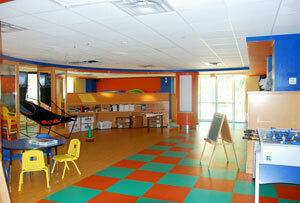 The Kids Club offers half day, full day and evening programs. Half day programs are available from 9 a.m. to noon and again from 1-4 p.m. daily. The cost is $25 per child and lunch is not included. Full day programs are $35 per child and run from 9 a.m. to 4 p.m. daily. The Kids Club's night time programs allow parents to have a romantic dinner or some time out on their own. Evening programs are offered on Wednesdays and Fridays from 6 to 9 p.m. at a cost of $30 per child. The 15,000 square foot Emerald Mist Spa also offers a full menu of family-friendly spa services kids ages 6 to 17. The "Princess for the Day" package for girls ages 6 to 16 includes a manicure, pedicure, glamorous up-do, sunscreen, glitter makeup and lip gloss application. The "Teen Escape" package for lucky 16 to 18 year olds includes a deep cleansing herbal facial and a classic pedicure. Hair braiding and beading, manicures, pedicures, haircuts and conditioning treatments are also available as individual services. While the kids are enjoying their vacation experience, parents can get a little pampering of their own at the Emerald Mist Spa. A wide of treatments await guests including a mango sugar body scrub, a hot stone massage, and the Kittitian Massage, one of the resort's signature treatments designed to improve circulation and overall well-being. A couples' room with a private Jacuzzi and dual-head shower is also available for a parents' romantic vacation interlude. The Spa also features hot and cold plunge pools, a state-of-the-art steam room, sauna, Jacuzzis, and a Roman bath. Golfers will enjoy the resort's Royal St. Kitts Golf Club, an 18-hole championship course with holes on both the Atlantic Ocean and Caribbean Sea. The links course design and the club's amenities have made the Royal St. Kitts one of the top-rated championship courses in the Caribbean. Special activities are available for family golfers, including Junior Clinics, afternoon programs, and golf lessons. 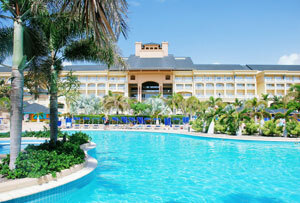 * For more information about the St. Kitts Marriott Resort & The Royal Beach Casino, visit the property's website at www.stkittsmarriott.com. * Call the Marriott's centralized restaurant reservations system when you arrive to make dining reservations for your stay. The resort's restaurants are very popular and family-friendly dining times can book quickly. * Make reservations for Kids Club programs as early as possible during your stay, or at least no later than one day before your child plans to participate in activities. For more information about the program, call (869) 466-1200, ext. 7809. * In addition to the restaurants at the St. Kitts Marriott Resort, there are many excellent places to dine around the island. Some of our favorites are the Reggae Beach Bar for lunch, Serendipity Restaurant, Mr. X's Shiggidy Shack (order the ribs or lobster if it's available), Marshall's (ask for an oceanview table), and Bobsy's Bar and Restaurant. * If you're planning to go off-property to explore or take a tour, make sure to plan your excursions for days when a cruise ship is not in port. Ask the Marriott's concierge about cruise ship arrivals or check on www.cruisecal.com for more information. * Currently, there are six ferries operating between St. Kitts and Nevis. Ferries operate regularly between 7 a.m. and 5 p.m. each day. For more information, look at the St Kitts Nevis Ferry Schedule or check with the Marriott's concierge. Sunshines is a good place to have lunch and chill out on the beach, or take an island tour. * Hurricane season normally runs from June until the end of November. Although the island receives most of its rain during the late summer and fall months, sunshine can still be abundant. On our visit to St. Kitts, we had many days of sunny weather and only an hour or two of rain during one hot, summer afternoon. It actually provided the perfect encouragement to use the resort's well-equipped exercise facilities. © Copyright 2019. The Beacon Group, Inc. All Rights Reserved.